Wooo HooOOooo! Tomorrow begins a two day site wide sale at Teachers Pay Teachers. I love a good deal and I love to find rockin’ resources for my classroom. I’ve already started filling my cart with some goodies! Today I’m linking up with my pal Amy Abbott at Music a la Abbott to share some awesome resources that you may be interested in putting in your cyber cart. First, one of my own. In college I was a chorus member in our production of Amahl and the Night Visitors. I loved the story and loved the music. I’m not a big opera fan, but this story and the music really captured me. I have found that this operetta is totally accessible to my 2nd-6th grade students. When I taught 7th-12th grades I used this with great success, but was hesitant when I decided to use it with 2nd graders while we learned about opera. They loved it! Okay...they giggled a bit and several times asked what was being sung, but it was DEFINITELY a positive response. I use this opera 2nd grade through 8th grade in December or January, but it can be used at any time of the year. Get it here. 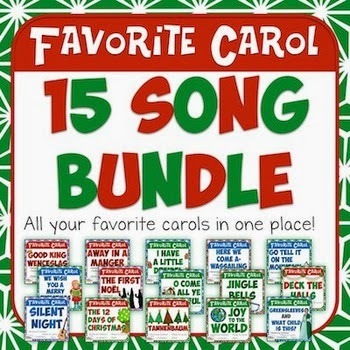 A rockin’ resource that I have had my eyes on for a while is David Row’s Favorite Carols Bundle. This was actually designed as a set of bulletin boards, but I think I’m going to use it as an instructional presentation during December. Each set contains some history on the piece, some fun facts and terminology and lyrics and notation. I love that this wonderful product is going to engage my students and save me lots of time! 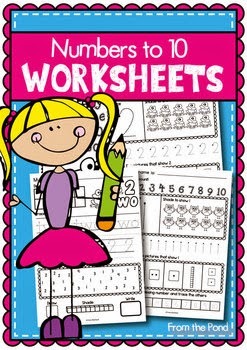 I’m also looking forward to purchasing Fromthe Pond’s Numbers 1 to 10 Numbers Worksheets. This is actually a purchase that I will use at home. My daughter is 3, but loves to do “work”. I think this looks perfect for some counting fun. The sale on Teachers Pay Teachers begins Monday, December 1st and runs through Tuesday, December 2nd. Most items in my store will be 20% off. Use the code TPTCYBER to save 10% on EVERYTHING. Items marked at 20% off will be 20% off with the use of this code. WOW! 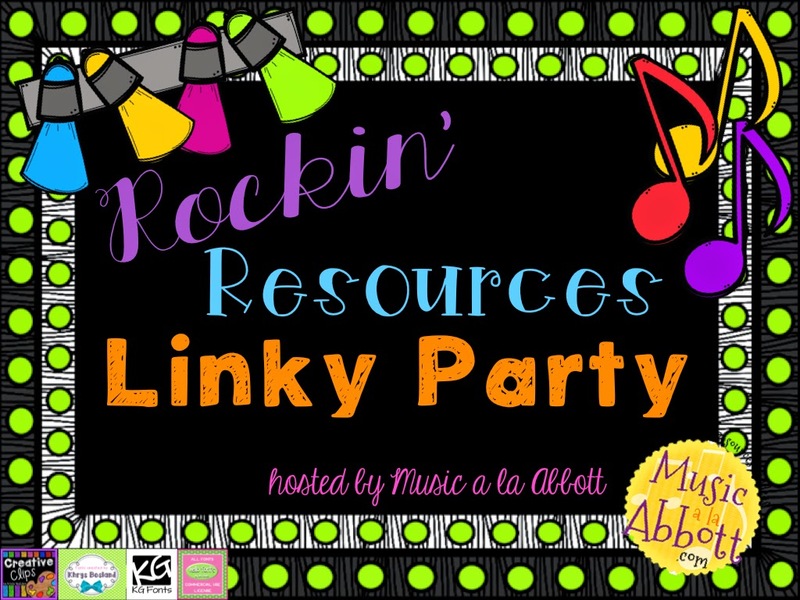 Check out the Rockin’ Resources Linky Party for more resources to rock your classroom. Woooo hooo! It's Friday! I'm linking up with Doodle Bugs Teaching on this fabulous Friday. I have a FULL day of school on the Wednesday before Thanksgiving. Holy moly! It has been on the calendar the entire school year but for whatever reason I didn't realize it. It was shocking. It was sad. Most schools in our area have a half day on that Wednesday and some of you lucky ducks have the whole week off! Okay...maybe it is, but in music classrooms everywhere it has SOUNDED like Christmas since the first part of October. I learned a long time ago that some songs will sour to my ears during concert rehearsals and that I will never ever again be able to enjoy them. Songs that have made this list in the last 20 years include "Grandma Got Run Over by a Reindeer", "Hark the Herald Angels Sing" and "Everlasting Fruitcake". I am also irrationally annoyed by that barking dog version of "Jingle Bells". 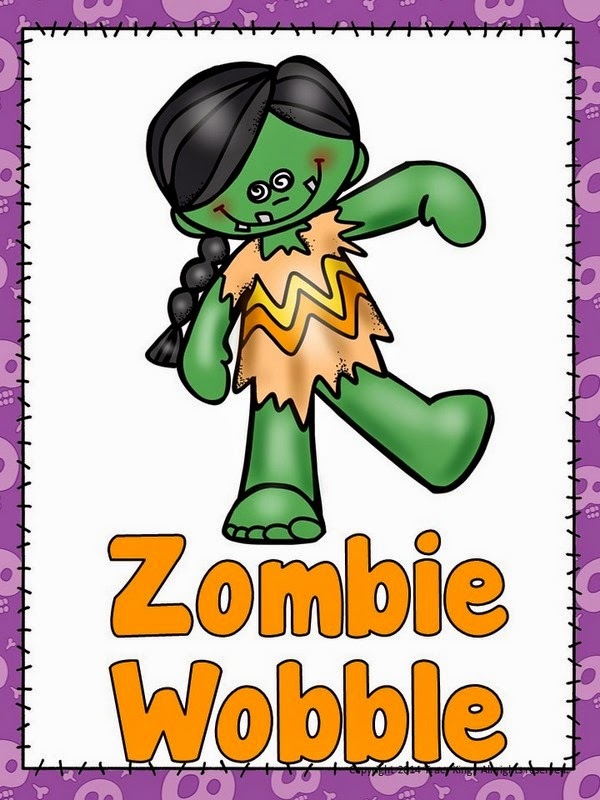 This week I've been dancing and frolicking with my classes using these Thanksgiving Creative Movement cards with my classes. They are great for brain breaks and really show me how creative my kiddos are! I've used them with Kindergarten through Fourth grades and wow! Such fun! I have a choir of 70 4th, 5th and 6th graders. This is such a talented group of kiddos! They are working on "Medieval Gloria", "Dona Nobis Pacem" and several other pieces that are challenging and they are doing a fabulous job! So excited to hear their improvement every week. I'm finding that on every choir day I spend every single free minute preparing for them. Typing and copying reminder letters, prepping the music and planning the rehearsal are just a few of the things that take up that time. I am amazed at the choral directors that deal with groups this size (and bigger) every single day. Their organization skills must be superb! A few things I'm thankful for: my awesome family, my fabulous job, my fabulous other job, homemade beef jerky, great ideas, tubanos, PowerPoint, that funny woman at McDonalds that always acts like she knows me and you-my blog reader. Once upon a time I nearly had a music teacher breakdown. It wasn’t because of the increasingly difficult amount of paperwork, the political takeover of education or even challenging students. One April I looked back at the number of songs my kids had learned in a year and was flabbergasted by how FEW there were for some grade levels. One grade had only learned 15 songs (that included songs for two concerts). Now, they had composed, improvised, explored, played keyboards and more but they didn’t sing too much more than that. YIKES! It was then and there that I devised a plan to remedy that. There is such a wealth of folk songs, seasonal songs and more that I could not allow this to happen again. I sat down and devised a plan for Song of the Week. My plan was to introduce a song (folk song, patriotic, children’s tune, MK8 favorite, camp song, etc…) every week. I knew that it would be a little tricky because at that time I was teaching Preschool through 8th grades. I decided that some classes would just “experience” the song. Some weeks that meant that PK-2 used the song as a way to keep steady beat and/or explore movement or form. Some weeks that meant that 7th and 8th Graders used that song to identify pitch names, add rhythmic ostinatos or sang it as a warm-up. I used a rainy day to compose a list of songs that I might like to use and I sketched a few bulletin board possibilities. I wanted to create a display so that when we had a few minutes at the end of class we could pick some of our favorite songs of the week to sing. Here are a few that I've tried over the years. When I started song of the week I saw my classes for 30 minutes twice a week. When my schedule changed to see my kiddos just once a week for 50 minutes, I needed a new plan. I would sometimes go a couple of weeks without seeing a group (especially if they saw me on Fridays). So, Song of the Week became Song of the Month. This worked well because students could sing or “experience” the song a few times that month. They were still getting about 10 “bonus” songs every year and I was thrilled that my whole school new many classics! I know that some of these songs seem random. *shrugging* They may be chosen for the month based on a holiday or theme or may just be songs I like doing around that time of the year. That’s the beauty of Songs of the Month. Do you do Songs of the Week/Month? What are your favorites? Let me know in the comments. I've created a set of posters that you may like for your songs. Sometimes I'll use the "Song of the Day" poster and just leave it up for the month. This year I am using this bulletin board to record our Songs of the Month. I’m just writing the name of the song(s) on each sheet with a dry erase marker. I’ve laminated them so I can save them and use them for something else if I want. You can snag them here. Shhh! Don't tell. I might be a hoarder. A crazy, crafty, fun-loving, what-the-heck-is-she-gonna-do-with-that hoarder. Really, it is something I inherited from my mom. She saved all sorts of things and sometimes even used them. She must have got it from her mom too. One time I needed some empty milk jugs for a VBS project. 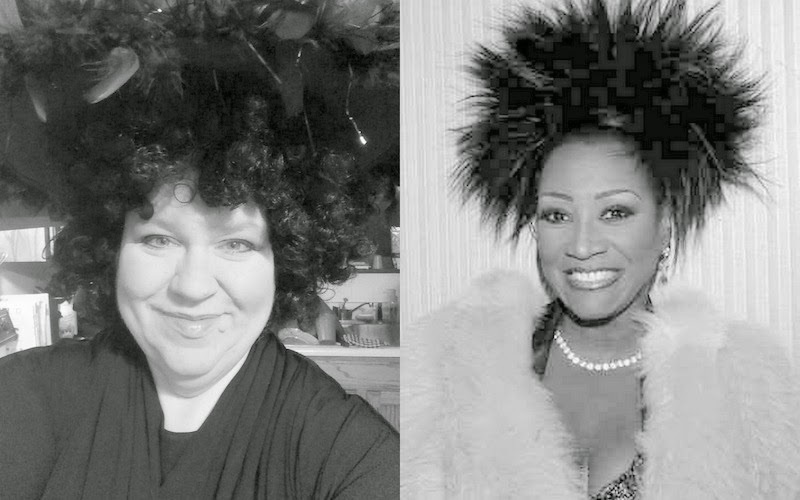 I went to my Aunt Marsha. She had almost FIFTY. LOL. Handy! For a while I collected bottle caps. Bottle caps from 2 liter bottles, water bottles and 20 ounce soda bottles work best. I was amazed at how many I had saved on my own and was overwhelmed when I put out a request to parents and the bottle caps started rolling in. I tossed them in some soapy, hot water and let them dry on a towel. I knew that if I was interested in playing with the bottle caps (stacking them, sliding them, making patterns) that my students would be too. Kindergarten: Distinguish between line notes and space notes. Notes that move up, down and stay the same. 1st Grade: Review what we've done in Kindergarten and experiment with step, skip and same. Towards the end of the year we learn C, D, E with Mr. Everybody and I hope to use the bottle cap staves to "compose" with those notes this year. 2nd Grade: Melodic dictation. Easy melodic dictation that moves by steps and repeats. We also use it as we learn CDEFG with Mr. Everybody. 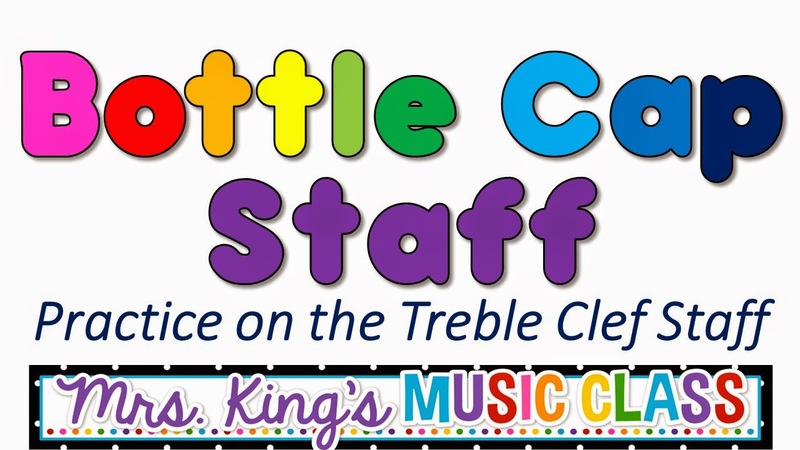 3rd-4th Grades: During the end of 3rd grade and most all of 4th grade we learn the names of all the treble clef staff pitches including a few notes above and below the staff. We use them to review the names. I'll say "Everyone put a bottle cap on C." Walking through the room, I am able to see who knows it and who doesn't. In 4th grade we spell words with the pitches of the treble clef. 5th-6th Grades : Usually we just use this activity for review, but with some groups it FEELS a lot like starting over. 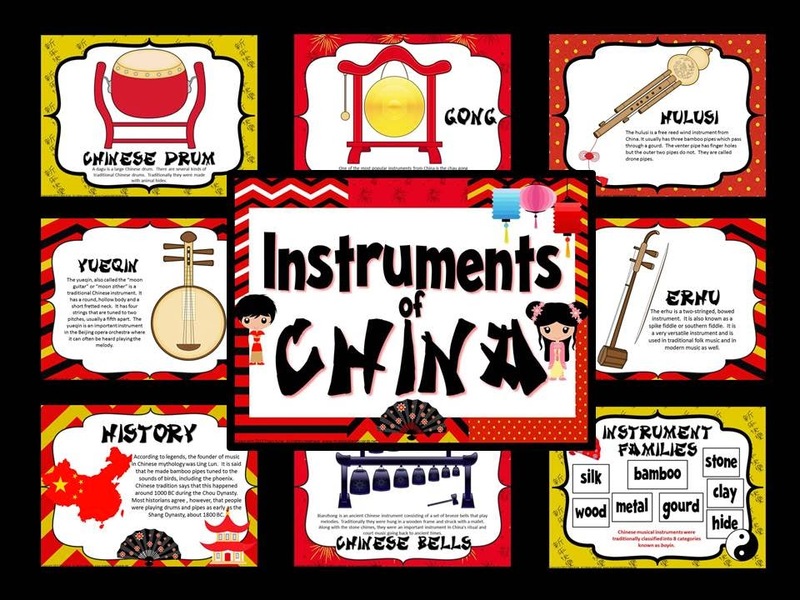 We will play games that help students find pitch names, spell words, notate ostinatos for Orff instruments and more. I would really like to do more with melodic dictation and hope to use the bottle cap staves when I introduce new solfege. Please share your ideas for bottle cap notation in the comments. You can get the bottle cap staff set here. We are using listening glyphs to record our observations about tempo, dynamics, tone color and personal preference. My 5th and 6th graders really enjoyed doing the glyphs as they rarely have an opportunity to color any more! It has been eye-opening for me to see how some students respond in this format. I'm definitely going to explore more ways to use this for listening activities. 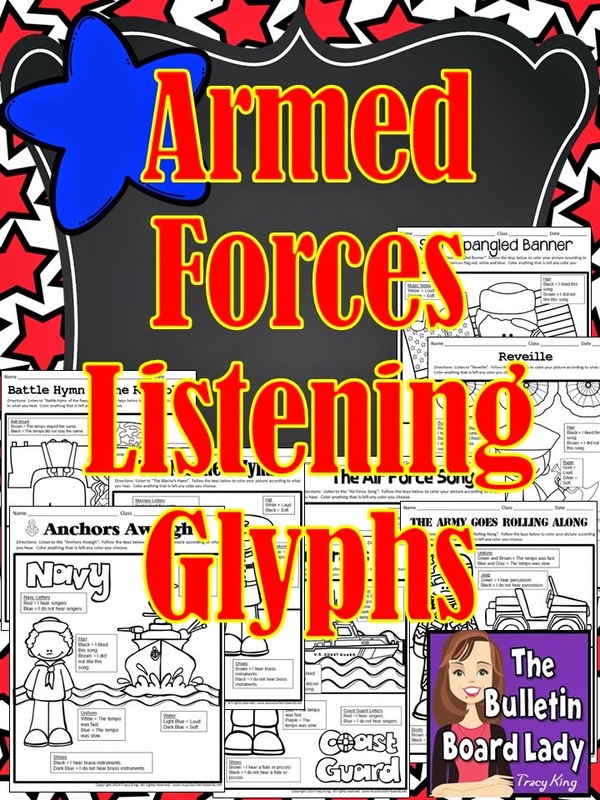 I am also using a presentation created by Sara Bibee that coordinates PERFECTLY with my glyphs and the armed forces bulletin board I have displayed. 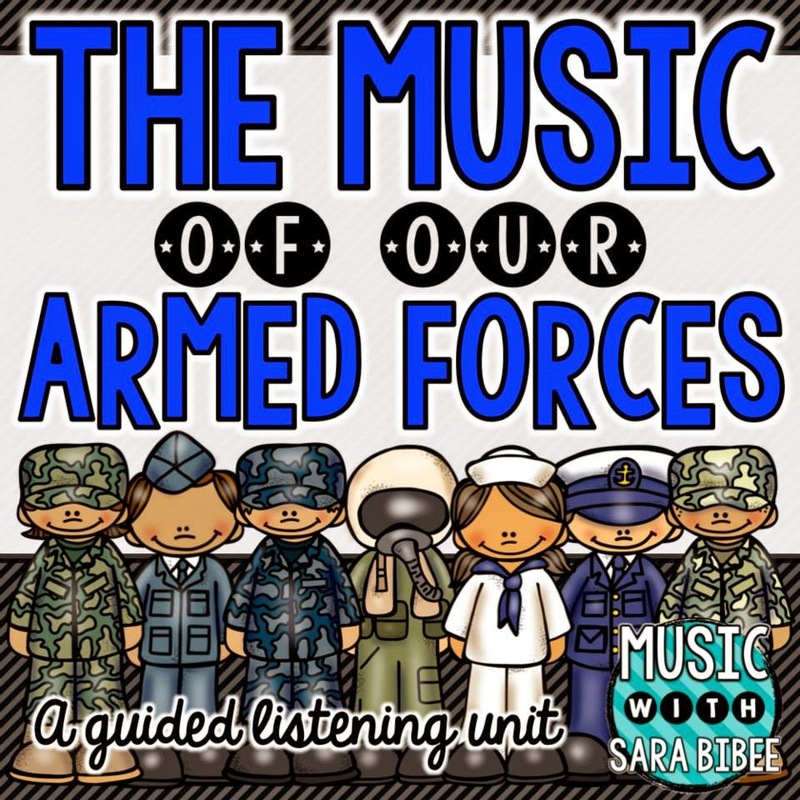 This handy guided listening unit lets me introduce each branch of the military and show students examples of each of the songs. My favorite part about this set is that the videos are linked via Safe Share TV. That means that I don't have to worry about what might pop up at the end of the video as an advertisement. We have used the same clipart in our projects so the listening unit and listening glyphs look like a seamless unit. This turkey was made using a pair of my toddler son's overalls. The feathers contain the names of my band and choir students. This display could work for classrooms or any group. It would be great to create a board that celebrates teachers by putting their names on the feathers. I have this board in my hallway right now. It is actually 5 bulletin boards! Each of the bulletin board kits represents each of the five branches of our armed forces. The bulletin boards contain the name of the branch, their colors, motto, mission, song and lyrics, a little history and more. I used just a portion of each kit so that my board focused more on the music and less on the history of each branch. You can get them all in one bundle HERE. Any month is a great time to focus on world music and cultures of other countries. This bulletin board kind of has fall colors in it so I think it works for this time of year It is SUPER easy to display. Print and post. No cutting or trimming needed. This bulletin board references a slightly older version of Facebook, but students will totally make the connection. It highlights a few composers who give "status updates" in the form of quotes or short narrations. 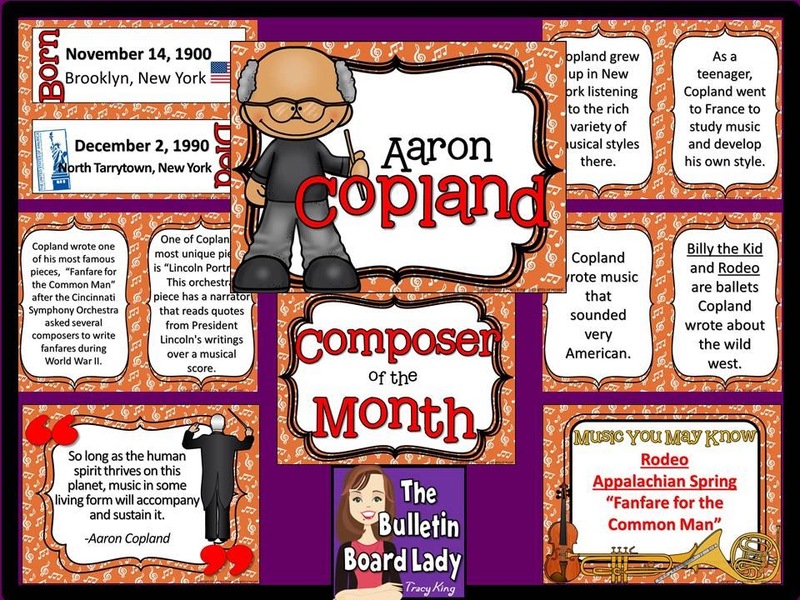 Aaron Copland's birthday is in November. 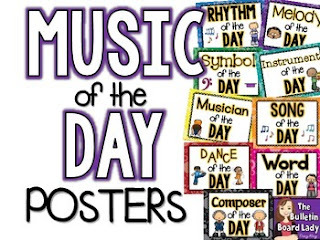 Celebrate it with this Composer of the Month bulletin board set. It also comes with writing prompts. 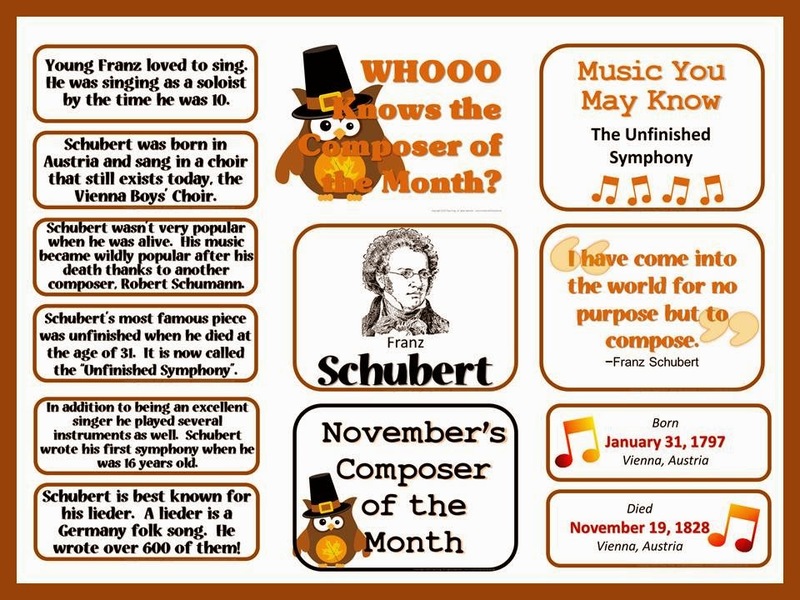 Schubert's birthday is not in November, but the date of his death is. LOL. That might be a little too gruesome! This is also a good option for November. This board is ready to go with the Thanksgiving theme and autumn colors. Not a music teacher? 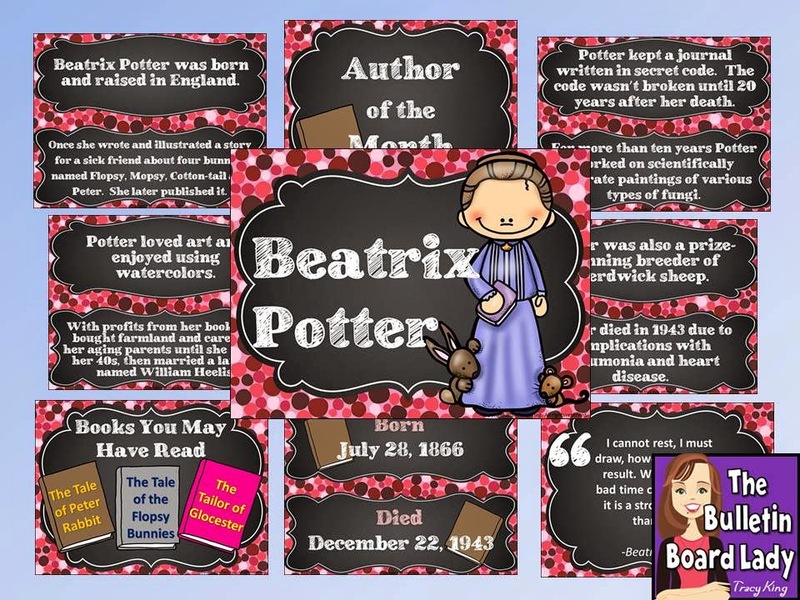 Try an Author of the Month Bulletin Board. This one features Beatrix Potter. 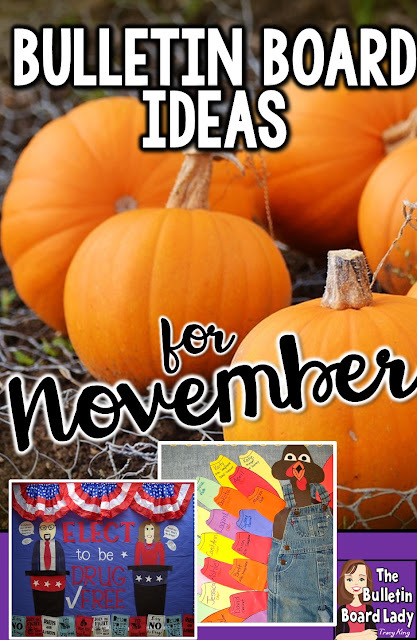 What bulletin boards are you planning for November? Let me know in the comments! 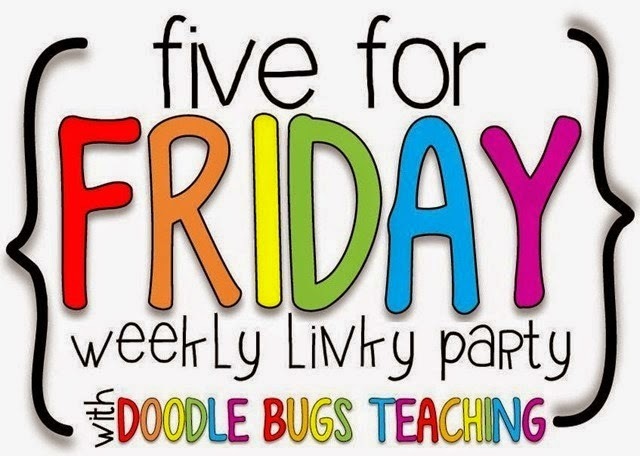 I'm linking up with Doodle Bugs Teaching for Five For Friday. Let me tell you about my week! 1. I survived Halloween week! WOOOOT! I am very thankful that my district makes Halloween an early release day. The whole day is fun and frantic. Lunch starts at 10 am, followed by a Halloween Parade downtown at 11:00, by 11:45-12:00 classroom parties start and everyone is stuffed full of sugar and pushed out the door by 1:00. 2. 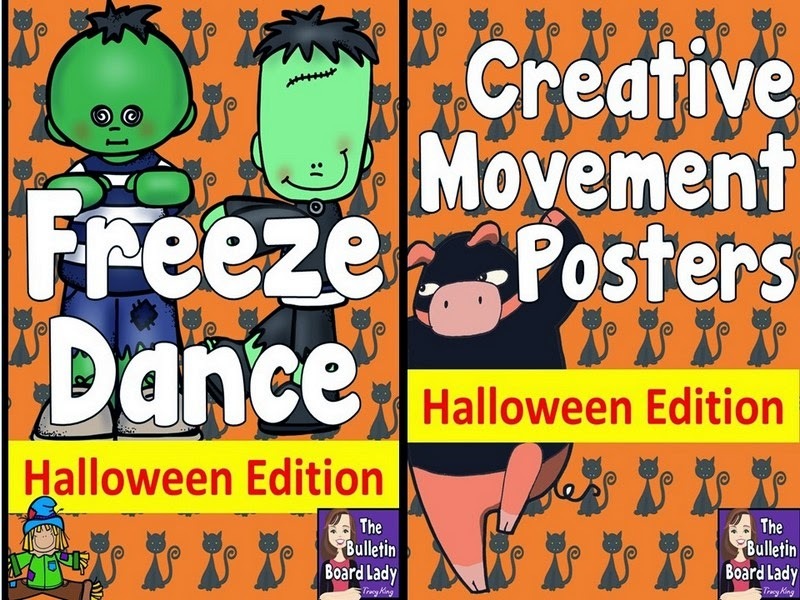 My kiddos loved doing creative movement with Halloween Freeze Dance and Creative Movement. 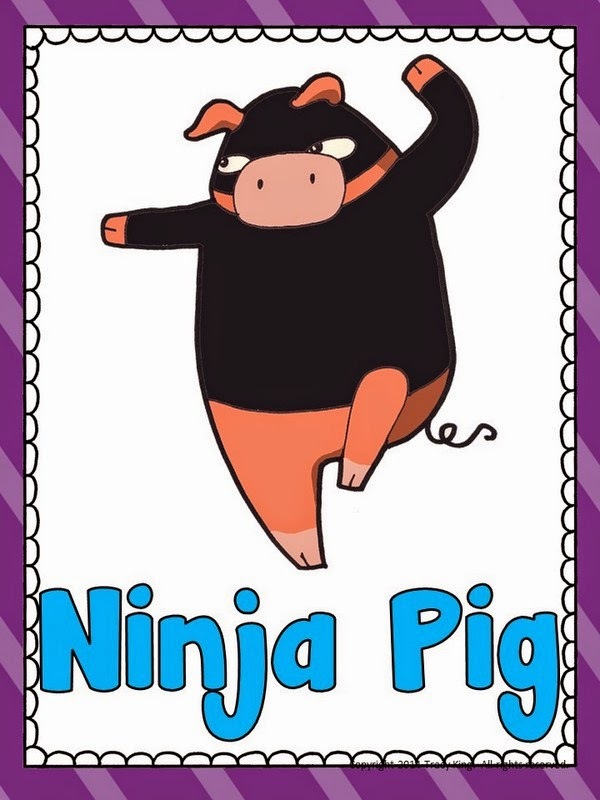 The Zombie Wobble and Ninja Pig were my favorites to watch! *giggle* We used some fun, spooky music like "Monster Mash" and "Ghostbusters" while exploring some creative ways to move. 3. I sat down to plan for November and it is going to be a crazy month! It is November 1st and I still don't know what the November Song of the Month will be! Each month I choose a song that all grade levels will experience on some level. Sometimes it is a song that some classes will sing and dance and analyze and other classes will just listen to. Sometimes they are pop songs, folk songs, seasonal songs or campfire songs. I really just need to decide so I can plug it into my lesson plans! Here's what I'm considering: Over the River and Through the Woods Thankful for the USA Seasons Change Don't Laugh at Me (see below) This is not exactly the version I will use. There's a great book with accompanying CD that I'll use instead.